The turtle is the Ojibwa totem animal of Truth. Totem animals reflect the lineage of a tribe, reminding them of their ancestry and their mythical past. The word ‘totem’ is derived from the Ojibwe word ‘odoodem’ meaning ‘his kinship group’. It is believed that each of the Ojibwa people have animal totems that are spirit guides who sometimes appear in dreams. Native American Indians were deeply spiritual people and they communicated their history, thoughts, ideas and dreams from generation to generation through symbols, such as the Turtle symbol. The turtle was here during the creation of Earth and carries the teachings of life on his back. This sacred figure represents Mother Earth. The turtle lives life in a slow and meticulous manner, because he understands the importance of both the journey and the destination. It symbolizes good health and long life. The hard shell of the turtle represents perseverance and protection. 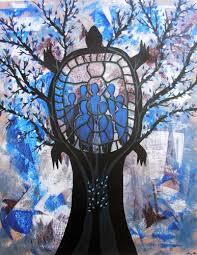 In the world of the Ojibwa, the turtle is the truth of all things to know. What is the symbol of truth in our Western Society? Do you show honour and sincerity in all that you say and do? Most of all, are you true to yourself? Understanding our place in this world and then applying that understanding in the way that we walk our path, is that being true? Speaking our ‘truth’ is one of the biggest challenges perhaps that we come face to face with in our life. If we want to elevate our Souls growth, it will be necessary to look at the truth of ourselves in the mirror. We must come to a place within ourselves, where we are completely free from any inhibitions. Free from obstruction or restraint, that would hold us back and not allow us to speak from our heart. This is speaking your ‘truth’, never second guessing your words. We have a lot to be respectful for, in the Truth of the Turtle. A slow and steady totem, one which carries the teaching of Mother Earth on it’s shell. The importance of appreciating the journey, as much as the purpose or goal, is for the wise and clever.